Concerned about conkers volunteers descended on Osterley Park this weekend to sweep up fallen leaves harbouring the pupa of the leaf miner moth. 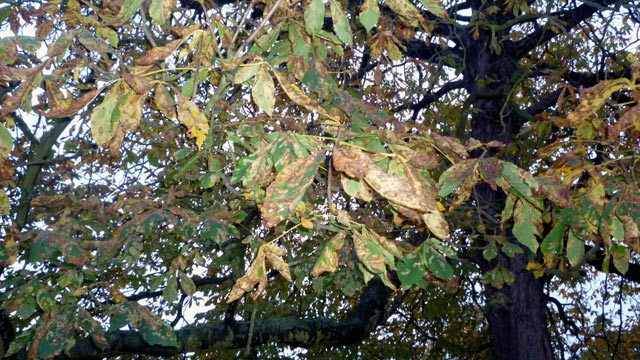 Whilst the majority of Osterley Park's trees are in fine autumnal blaze, the Horse Chestnuts have been blighted by burrowing leaf miner moth larvae which disfigure the leaves, prevent photosynthesis and denude branches before time. The pests - which were first found on Wimbledon Common in 2002 - spoil the conker tree's chances of turning glorious yellow before seasonal defoliation. Fortunately, there is no evidence that the burrowing buggers cause permanent damage and if the infestation is removed, trees recover their vitality and 'flush' normally the following year.